Kendyll is all smiles as she goes on the scary up and down, thrust you out of your seat ride at the Aquarium. Finally, I am breathing more easily and with a sigh of relief. It has been a long two months since breaking my ribs and all the complications that have gone along with it. I am SO looking forward to this weekend where I can finally catch up on my yard, the gardening, the spring chores, mowing and de-cluttering all the winter stuff. Who looks forward to that kind of weekend? I DO!! I also want to take this post and talk about all the great stuff that happened in the two months that I was pretty much Missing In Action. First, Amber, Riley and Lexi came for a visit over the Valentine weekend. I was lucky to see them so often when my momma was alive but since her death, our visits have gotten further apart. They had not been to the farm since spring of last year. Six year-old Riley was telling four year-old Lexi about the animals at Granny’s farm prior to the trip. He looked up at his mom with great interest and asked “whose died since we were there last?” I am meeting my goal to have my grandchildren understand that the promise of life is the promise of death but perhaps it has become a tad too routine. And the answer for those that are wondering are just our two dogs killed by our neighbor’s dog. Bad enough. Of course, everyone got out to ride. My big mare Nova proved once again what a great girl she is by giving Jordyn a fun ride and then letting Lexi and Riley pilot her around double. Pretty laid back, I would say. The kids got to ride a lot and all had fun. We headed out to the Houston Aquarium which was another fun event. Kendyll proved to be the daredevil as always, riding the scary ride more times than anyone except Amber who only went begrudging along since Kendyll had to do it “again!!!”. Everyone else wanted to throw up. On the way home we stopped at an area park. The weather was beautiful especially for my Colorado kin. We all enjoyed acting like kids along with the kids. Amber, Jordyn and Lauren playing at the park. I decided we were all going to climb into the kid tunnel. Family bonding time-YAY! Friends from Chicago decided I needed shirts for my girls and I from our 40th High School reunion. I attended a school called “Fremd” , ya, I don’t know who that was. Anyway, in trying to get a shot of my daughters and I, Maui Jim and Kona jumped in. I love Maui’s face! In other news, Lauren’s show horse Feather had a minor setback when she pulled the skin off the back of her hoof. She will be out for awhile as that area is notoriously difficult to bandage and heal. We thought this would be the season Lauren could finally get back on track with her riding and are disappointed to have Feather out. Lauren lost so much time with her broken arm and now I guess it is Feather’s turn to rest. You know my favorite saying: “Man plans, God laughs”. So true. Lauren has been lucky enough to ride a variety of horses (which will ultimately make her a better rider) at her trainer’s during this time. She got to ride a beautiful thoroughbred/Oldenburg cross mare in the show last weekend. 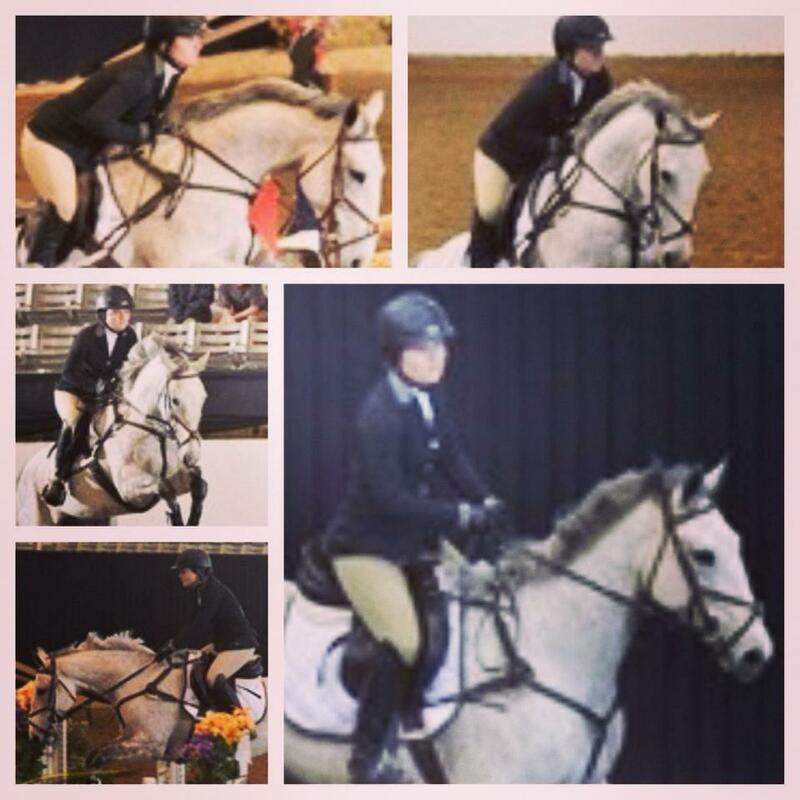 It was a great experience and one which will broaden her abilities as a rider. A beautiful mare- Lauren enjoyed the opportunity to ride her. I am also including this updated picture of my mare who is due in June. She has quite the baby belly already. She will be as big as a house by June. We are so excited about this upcoming Flagmount colt! I had my last birthday before I turn 60. I am really getting old but feeling so much better, I feel young again. 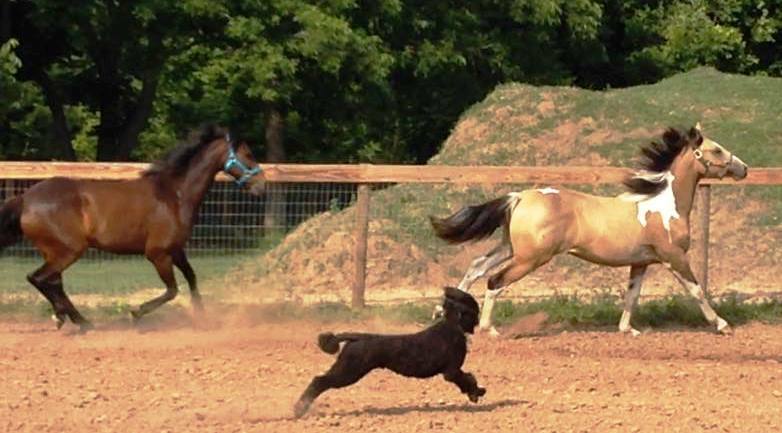 It is time to get my spring flowers in, start riding my mare again and spend quality time with my pups. Wishing everyone a great weekend and thanks for always riding along. Lauren has finally returned from her trip to The exotic and yet achingly familiar place of her birth in Florida. Evidenced by her boots left lying on my kitchen counter her first night home, the farrows of her boot’s sole lined with fine, white Florida sand, she walked (and rode) many miles during her stay at the Wellington Equestrian Festival (WEF). And we have missed her. As much as Ally stepped up to perform an outstanding job on everything at the barn and the farm, we were all glad to know Lauren was home. Ally was in many was a better manager and keeper of my clan than Lauren but in the way a new, eager (not yet exhausted and broken) employee steps in at the holidays to work retail. I know we will miss the little extas that Ally provided us with while she was our barn manager. From Ally’s perspective, the whole event climaxed on her last day to cover Lauren with an extreme bloody horse injury, and Ally was eager to hand the muck rake back to her sister. But I also feel that Ally learned a few things in this process. Like how much work was really entailed in this job of her sister’s. The sneak attacks that hit you just when you think the day is done and a horse goes down to colic or rain drives all the horses back to the barn just as you have completed turn-out. Nothing like walking a mile in someone else’s shoes to appreciate what their life is really like! Blood has never been Ally’s thing. Any mention of following in her other sister’s footsteps to be in the medical profession have always fallen on deaf ears. But when Ally had to handle literally buckets of blood she did so readily (although she did gag a lot) and Thank God she was there! Lauren, likewise, learned a bit about the real lives of top equestrians. Through her days circulating through Grand Prix Village (on an actual imported Grand Prix horse) or working as the trainer’s aide, she learned immense amounts about hard work. And not just her work either. The riders she saw had worked years and years, lifetimes in the saddle, to be as good as they were. She learned there were no short-cuts to fame. You all have read about Lauren’s friend Caitlyn. 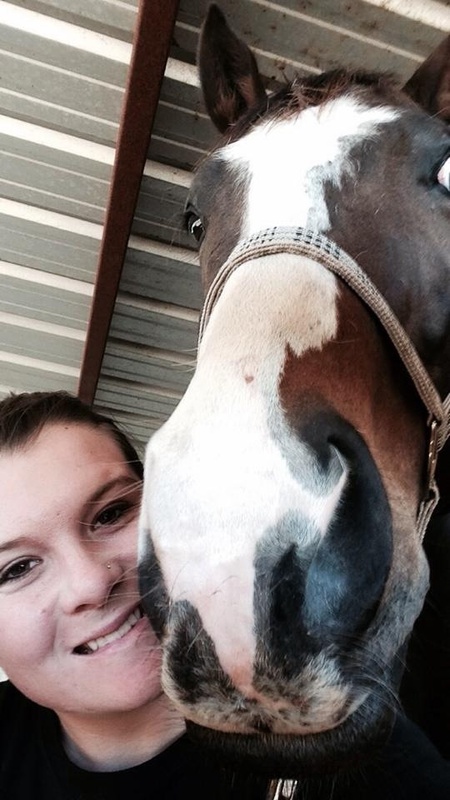 You can search this blog for stories of Caitlyn’s many horse shows (Harrisburg, Washington Invitational, Maclay rounds, West Coast Talent Search) and hundreds of rides right here in Texas. Lauren is a couple years older than Cate but Cate has spent way more time in the saddle and at the big shows perfecting her art than Lauren has. In all my years in the horse industry, while I have known many to ride at WEF, I have never had a real relationship with anyone who won at WEF. Like, I have never really known them-they were a top rider that I had heard about in the media. This is exactly what Caitlyn and her horse Ky did! I was thrilled to hear of them winning a class-how exciting is that? But to come back and place high enough to win the whole division and be GRAND CHAMPION AT WEF, well, that was quite the way to end the show. A ride with all the other grand champions on Sunday, in the International Ring, was the icing on the cake. 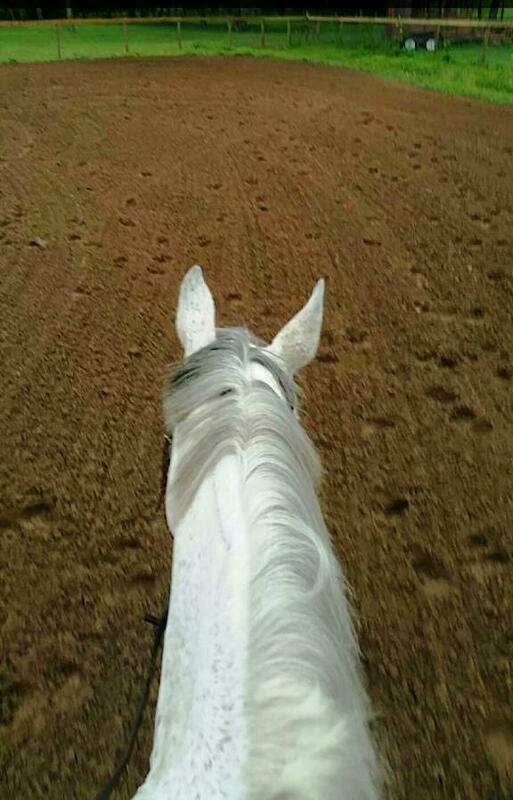 To ride in the arena where so many greats of sport had ridden before her was unimaginable thrill. On a side note for those of you that like the star factor, Mary Kate Olson (yes, Full House Mary Kate) rode against Caitlyn in her division. She rode not one horse, but four of the best horses that money could buy, but Caitlyn was there to win and had the experience to do so. Finally, back home with Maui Jim and friends, I told Lauren how good he had been. No eating FitBits or chewing shoes. I wasn’t missing my glasses either. I thought we had finally passed over puppyhood and he was getting to be an adult. We will let you know how the power of God is effecting Maui. The race is on and Kona is doing his best to keep up with Betty Sue and Piper. 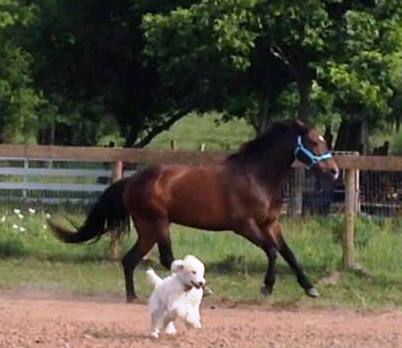 Maui running with Piper Pony. We have now had several consecutive days without rain. As you can see, the horses (and the dog) are even turning up a little dust in the arena. That is grounds enough for a little celebration. I am getting through this first anniversary of my mother’s birthday without my mother with a few tears but a lot of happy thoughts and memories. Last night, we took the girls down to play in the arena. The last time I did this, Feather wanted to come, too. She pulled back from where she was tied at the barn and ended up with a face full of stitches. This time we left Feather in her stall, the fan running, oblivious to her friends having fun without her. It was amazing to see, now a little over a year old, Betty Sue, romp around. 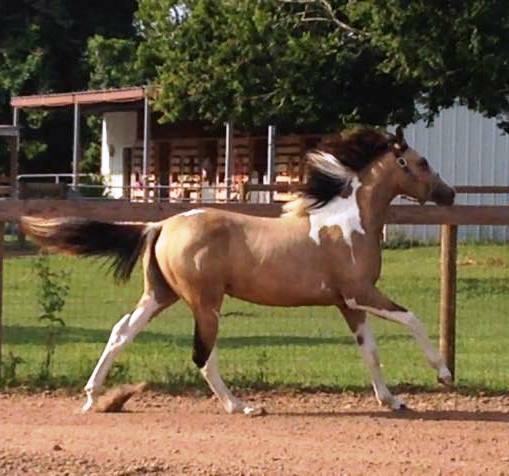 I swear she has the prettiest trot I have ever seen. Of course, I didn’t get a picture of that-she was too busy running! Kona and puppy, Maui Jim, were all keyed up for play time as well. You will note fewer pictures of Maui. He tuckered out way before the horses and Kona did. I love the white streak in her mane and that her tail has the white tip at the end. Back in my day we would have said, “Kona is really booking it,” here. 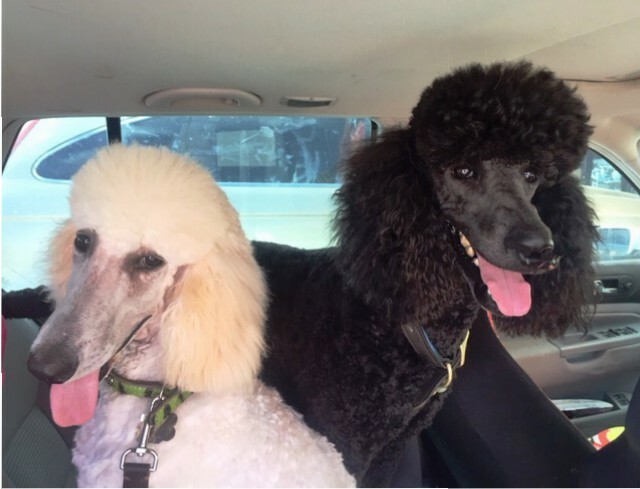 The dogs went off to a new groomer today. This is Maui Jim’s first official hair cut. Lauren told the groomer to make him look like Kona. What do you think? Maui Jim is a skinny puppy but OMG look at those feet!! He is going to be bigger than his brother! 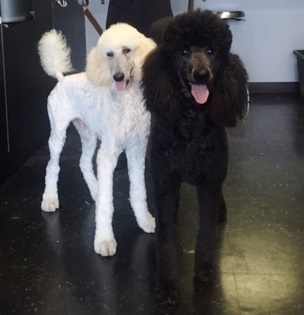 This was a new groomer who specializes in poodles and it showed in the great job they did. Oh, it is the little things for me! The farm is pretty much dried out with grass and the flowers growing like crazy. I have lots to do this weekend with Lauren’s impromptu working student summer starting on Monday with the arrival of Mia from Malaysia. We have worked out some great educational seminars for the girls including working with the farrier, learning basic first aid and how to build a horse first aid kit with the vet, a session on learning to pick horses for the Grand Prix and being a successful trainer in the horse business from some local hot shots. Jordyn and Riley finished second grade and kindergarten respectively and are looking forward to a summer of fun. Jordyn is headed off for a week of horse camp with Holly Flint and Snowboy! In fact, I am hoping to get them on the lunge line tomorrow for Jordyn’s first canter “on-purpose”. Big times! Lots to do, lots to see, lots to accomplish. Hoping you are taking a moment to appreciate the little things. They are really what life is about. Thanks for riding along! 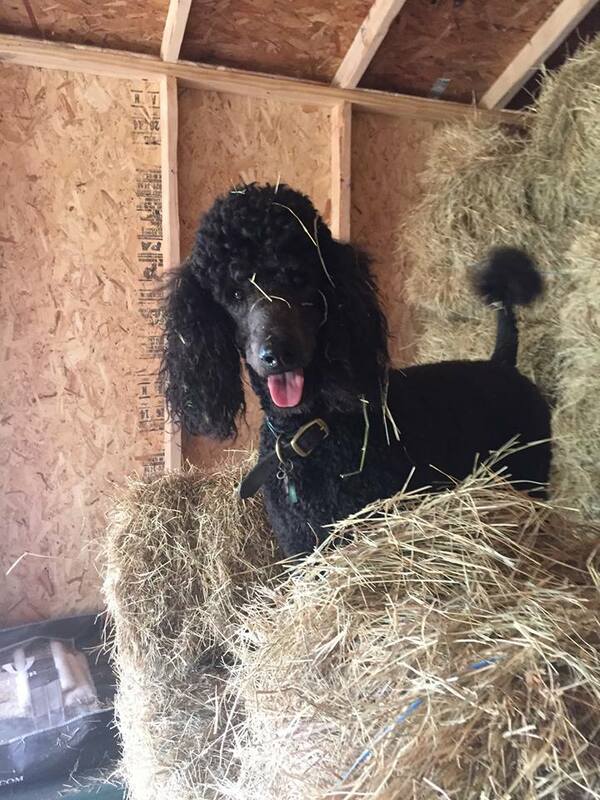 Happy Kona on Mother’s day “helping me” with hay. I guess that title is a little too dramatic. I do regret that I have not written. It has been too many days. There have been ups and downs which we will discuss, but I promise to make every effort to write at least two, hopefully three times a week. It is over a year now since we landed in this new house, built new barns, arena, got new horses, lost some dear animals and met new friends. Our boarding and training business (which right now is limited to training our own steeds) has grown in size and complexity. A year ago we fed two types of feed and offered two kinds of hay. Now, seven cans of various feeds sit in our feedroom with three kinds of hay (coastal, alfalfa and timothy). Our horses are a varied bunch with the three original rescue horses (Mickey, Cody and Snow), three ponies (Molly, Snow, Piper), three OTTBs (Hershey, TryDelta (off-site) and No Play), Two Paints (Mickey and Nova), Five warmbloods (Prosecco, Kinnaras, Betty Sue, Fargo and Feather) and one Grand Prix Dressage horse (Kinnaras). The range in size from 13.3 hands to 17.2 hands. You will note some horses are counted in multiple categories. Point is, it is a busy and diverse crowd. I might be in the tack room looking for a 22-inch western girth for Piper or a 54-inch English girth for Nova. It certainly has become more than a fulltime endeavour for us. I have not been gone on a weekend from the farm since we moved here, except for my mother’s funeral. Lauren does a nice job with much appreciated help from her sister Ally in managing the daily activities. That leaves me, and often Ally, with night-time and weekend work. Lauren budgeted for five horse shows for this year. They are expensive and we have limited funds for the big shows. This week’s MayFest has traditionally been a great show for us. Last year, Feather made her first run at the 1.05 meter and earned three ribbons in three classes. Mickey has always been the king of the fest winning multiple championships. Wednesday, I headed to the arena with baby Betty Sue (who at over 14 hands is not so babyish anymore) and pony Piper to give them some play time. Lauren was going to ride, had gotten Feather out of her stall and strapped her in the cross-ties. I let the little ones loose and off they ran! Feather, never being so sturdy of mind or space, immediately wanted to take off with them. She set back in the cross-ties, rearing and slamming her face multiple time into the sharp tin of the roof. Finally, she broke free and proceed to run to the arena with blood streaming down her face. Like go to the vet now blood! What you don’t see-her eyelid had to be sewn back on. The vets thought that Feather could still compete at the show but the swelling did not recede as fast as we hoped. Lauren took Mickey for Alex to ride and agreed to show him for her on Friday while Alex was at school. I had been apprehensive about this. Mickey and Lauren have a long, dramatic history of Mickey throwing Lauren to the ground. Mickey performs better for Alex but I was still scared. Lauren jumped him four feet at home to show me they were great. They would only be doing the .90 meter (which is about 2’9″) at the show, what could go wrong? Mickey was reluctant to jump the oxers from the beginning. Lauren was in the class for the win and pushed him up to each jump, setting him up well and using her crop as needed to tell him she was serious. 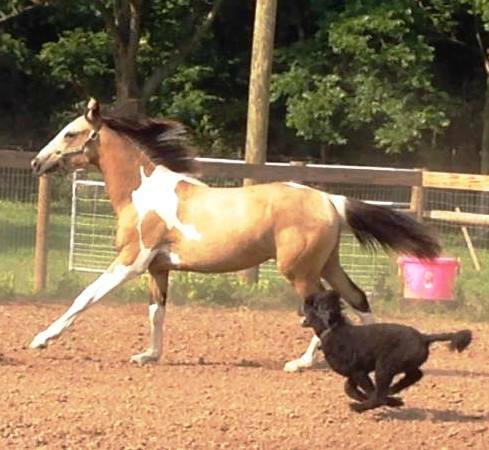 At jump seven, Mickey galloped right to the base of the jump and did a sliding stop to rival any of his paint horse reining relatives. Lauren went flying through the air like a lawn dart hitting both poles with her head before stopping. And this is why Lauren does not show Mickey any more! A slight concussion and stiff neck later, she went and scratched Feather from the show. I am all about pushing on, but when your horse has a face full of stitches and you have been a human lawn dart, it is time to say you will wait for the next show, thanks anyway! Saturday, unexpectedly with no show to show in, ended up to be a fun day for Lauren, Jordyn, Kendyll and I. We took Kona and the new poodle Maui Jim with us. We went by the show and checked up on Mickey and Alex. It was Maui’s first horse show and he was great! We left soon after headed to the expansive George Bush Park (of course, Houston would have a George Bush Park, and the dog park is called…wait for it…The Millie Bush Park after President Bush’s cocker spaniel). We did not go to the dog park (we kind of have that at home) we did go on a hike down to a pond and let Kona and Maui see what they thought about water. I have never had Kona to the water although Poodles are known as water dogs. The sign clearly said no wading, no swimming and no off-leash dogs because alligators could be nearby. Still, I threw the stick out in the water and Kona and Maui bounded out in search of it. Maui got out a little further than he intended and had his first swim. He did not go back in the water. The girls had a fun time wading on the sandy beach until we actually saw an alligator and thought it would be a good time to put everyone’s shoes back on. 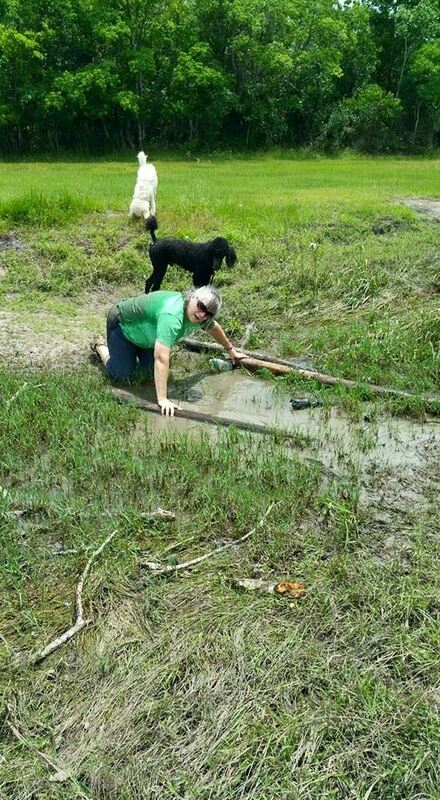 I managed to fall fully in the water trying to balance on a log going over the trail. Lauren was laughing so hard she almost dropped Kendyll. The dogs just stared at me like I was stupid wallowing in the slime on all fours like a common dog. Totally covered in slimey water and unable to get my feet under me and get up. So you can see I have a lot of reasons for insanity. Plus it runs in my family. Thanks for riding along! I promise more wonderful days of action from the farm. If you are on Facebook, look up Six Meadow Farm and see some more pictures of our place. We have a spot for a new boarder, too! Think how fun that would be! 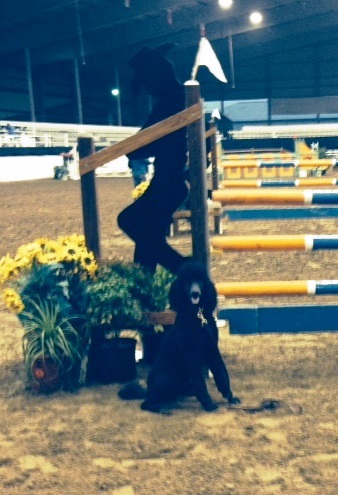 Kona in front of the jump at this weekend’s show. 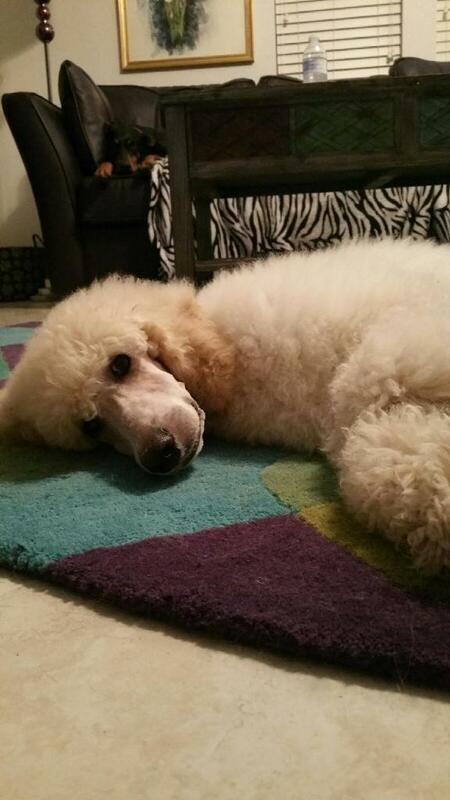 It has been almost a year since I got my poodle Kona. Lauren yelled at me as I made my way home with him that night, but I have certainly won her over. Kona has won me over as well. I have other dogs but because I take him to the shows, the nursing home and even to Dairy Queen I spend more time with him. I think he has won over a few non-Poodle lovers he has encountered as well. Let me know if you have met Kona and enjoyed his poodly oodly self. Point of this (although this post is called “Jumping Around” and I am going to do so a lot) is that even when I nicely asked Lauren to stand in front of the jump as the course was open for the riders to walk, she refused. She said it was embarrassing to stand in the giant arena and have your mother take your picture by a jump. Okay, I sat Kona down and told him to stay. He not only stayed, sitting pretty at the jump, but I swear he smiled as well. He was not embarrassed either. Kona does have a little issue with other dogs although I am not clear why that is true. 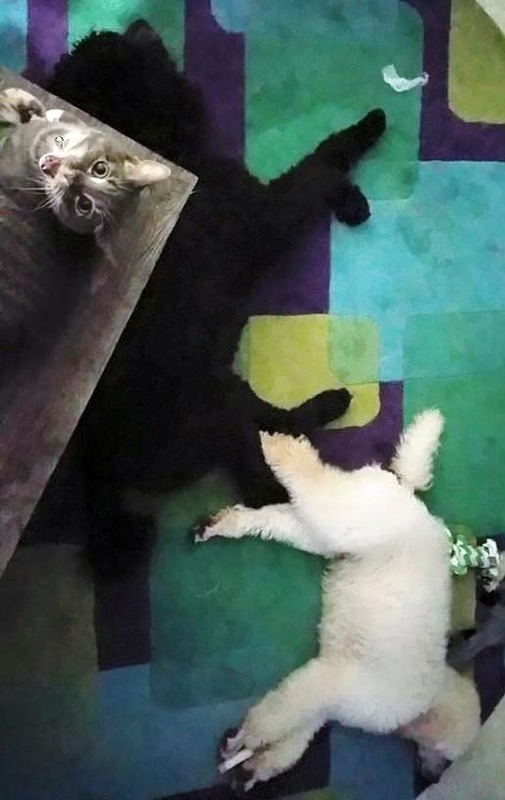 He has been around dogs (although I do not believe he thinks he is one) since birth. I have six other various shapes and sizes of dogs. But when we get out, if a dog is loose and comes toward him, friendly or not, Kona bears a quick retreat backwards, dragging me with him. At the show this week, we rounded a corner and big Corgi (who should have looked a little like Sneaky) came barreling up with two other canine friends in tow. Kona dragged me backwards. I came to two realizations at once. One, I was now standing in the men’s restroom with my poodle and two, the Corgi was Nordic owned by Bruno’s former owner and former husband of Sneaky. I mean it was like running from family, which sometimes is a good idea but not in this case. The dog phobia thing got a little better as the weekend wore on and I was proud that I didn’t spend any more time in the Men’s room. Other things got better as well. Lauren had a good ride in the 1.05 meter class. Feather was quiet, accommodating and on her best behavior. Over the years, (I looked it up) Mickey placed in the 1.05m twice. So, it was a big day to have Feather make her debut in the event and place sixth out of 23 horses. I was hoping for a chance to see her go in the 1.05 Classic but Dev decided to end the show on a positive note and we all packed up and headed home. In the totally schizophrenic world of south Texas weather we went from the 70s to the 30s again on Sunday. I have lost count of how many times I have covered and uncovered the plants. I thought it was funny when the weatherman said, “well, if you haven’t brought those plants in yet, they are probably dead so don’t worry about it tonight”. But then I am easily amused. 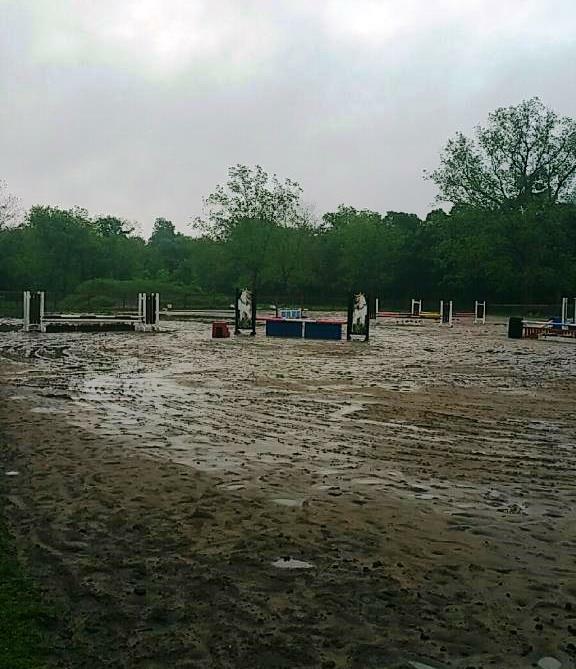 We had left for the horse show early Sunday morning and left all the horses out in pasture without blankets. I knew it was getting colder but thought we would get home first. We returned to Wharton with Feather to rain and cold temperatures. For once all the horses had been smart enough to come in out of the wet. We called to set an appointment for rescue kitty Levi and Kona to be neutered tomorrow (told you I would be jumping around). The vet office, verifying they had the right cat, asked if this was the tiny grey male we rescued in October. I answered yes and asked how much he had weighed when he was last in their office. They replied he weighed 15 ounces. That was less than four months ago, and I guess you can say his stomach problems are a thing of the past. He now weighs over 11 pounds. Seriously. The vet reminded me that this was a cat not an Irish Wolfhound puppy. Oh, boy, I guess we will have to watch his weight. Kona going to be neutered is causing me a lot of angst. I want to ask my supervisor if I can take the day off for a family member having surgery. I feel it would be appropriate. Don’t think she would. GEEZ! Here is a collage from Lauren and the show. Thanks for riding along on this crazy train. May God bless you and keep you! Lauren and Flagmount’s Irish Freedom at the Winter Series.